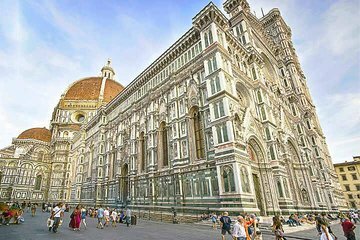 Visit the Accademia and Uffizi galleries, the two premier museums of Florence, and see the sights of the historic center, too. After a morning tour of the Accademia Gallery, learning about Michelangelo and seeing David, you'll have a break for lunch. Meet back with your guide for a tour of the center and hear the history behind Piazza della Repubblica, Florence Duomo, the Ponte Vecchio, and more. From there, you'll finish up with a tour of the Uffizi Gallery, discovering works by Italian titans like Sandro Botticelli and Leonardo da Vinci. Both our guides for our combined tour on Friday, September 14th! Very passionate about their topics and would recommend them both for future tours. Even though we had transportation issues and arrived to the tour late, Viator took steps to help us still engage in the experience as much as possible. The group size was small and the guide was very pleasant and full of interesting information. Particularly, her narration through the Uffizi felt like a high quality art history lesson. Tour hosts did not make themselves noticeable. We had a very difficult time finding our host. Tour was great but started badly and could have been missed. This is a great day but really long! Skipping the line and seeing David is the highlight as well as the walking tour of Florence. Was really glad to have a personal interpreter for the art. This tour was soooo well worth it. A definite must do, if time is limited in Florence. Both our tour guides were amazing. Rosa was lovely and very knowledgeable. I don't remember the name of the gentleman guide, but he was great as well. Neither one of our guides was particularly good. For the Uffizzi tour the guide didn't explain that we were only going to see David. Please know that this is not a museum highlights tour... it is a David tour. Now he did a great job talking about David but nothing else. Also there were no ear pieces so at times it was hard to hear him and understand him. The guide for the afternoon portion was very hard to understand so unfortunately we didn't get a lot out of it and finally just gave her the ear pieces back and headed through the museum on our own. What Viator doesn't tell their travelers is just how much walking is involved in these tours. We did not do this tour simply because we were exhausted and disappointed from previous tours. We had an amazing time touring the museums and city of Florence! Very beautiful with lots of interesting information provided by the tour guides, which enriched the experience. Be prepared for lots of walking/time spent on your feet. A wonderful tour of Florence, seeing the major artwork: David, and the highlights of the Uffizi. Also good was the in-between rapid tour of the outdoor sights in Florence. Come early in the day, and go by yourself to the Medici chapel St. Lorenzo to complete the cultural experience. The first tour is a bit monotone, but after you switch guides and the rest wakes you right up as you walk through Florence and end up at the uffizi. She guides you through the highlights as there are many rooms and makes sure to tell stories about the important pieces of work.